Extending previous work [Pusztai et al., Phys. Rev. E 87, 032401 (2013)], we have studied the formation of eutectic dendrites in a model ternary system within the framework of the phase-field theory. We have mapped out the domain in which two-phase dendritic structures grow. With increasing pulling velocity, the following sequence of growth morphologies is observed: flat front lamellae → eutectic colonies → eutectic dendrites → dendrites with target pattern → partitionless dendrites → partitionless flat front. We confirm that the two-phase and one-phase dendrites have similar forms and display a similar scaling of the dendrite tip radius with the interface free energy. It is also found that the possible eutectic patterns include the target pattern, and single- and multiarm spirals, of which the thermal fluctuations choose. The most probable number of spiral arms increases with increasing tip radius and with decreasing kinetic anisotropy. Our numerical simulations confirm that in agreement with the assumptions of a recent analysis of two-phase dendrites [Akamatsu et al., Phys. Rev. Lett. 112, 105502 (2014)], the Jackson-Hunt scaling of the eutectic wavelength with pulling velocity is obeyed in the parameter domain explored, and that the natural eutectic wavelength is proportional to the tip radius of the two-phase dendrites. 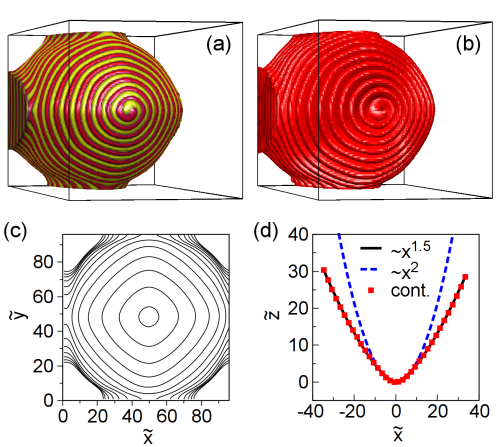 Finally, we find that it is very difficult/virtually impossible to form spiraling two-phase dendrites without anisotropy, an observation that seems to contradict the expectations of Akamatsu et al. Yet, it cannot be excluded that in isotropic systems, two-phase dendrites are rare events difficult to observe in simulations. 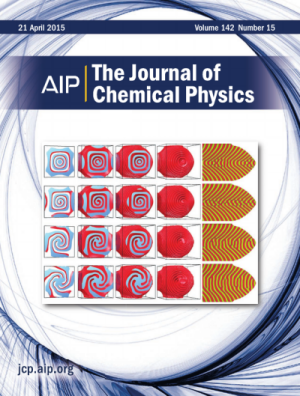 Advances in the orientation-field-based phase-field (PF) models made in the past are reviewed. The models applied incorporate homogeneous and heterogeneous nucleation of growth centers and several mechanisms to form new grains at the perimeter of growing crystals, a phenomenon termed growth front nucleation. Examples for PF modeling of such complex polycrystalline structures are shown as impinging symmetric dendrites, polycrystalline growth forms (ranging from disordered dendrites to spherulitic patterns), and various eutectic structures, including spiraling two-phase dendrites. Simulations exploring possible control of solidification patterns in thin films via external fields, confined geometry, particle additives, scratching/piercing the films, etc. are also displayed. Advantages, problems, and possible solutions associated with quantitative PF simulations are discussed briefly. Eutectic dendrites forming in a model ternary system have been studied using the phase-field theory. The eutectic and one-phase dendrites have similar forms, and the tip radius scales with the interface free energy as for one-phase dendrites. The steady-state eutectic patterns, appearing on these two-phase dendrites, include concentric rings and single- to multiarm spirals from which the fluctuations choose; a stochastic phenomenon characterized by a peaked probability distribution. The number of spiral arms correlates with the tip radius and the kinetic anisotropy.